Like the country itself, Hema's Western Samoa Map has been renamed Samoa. 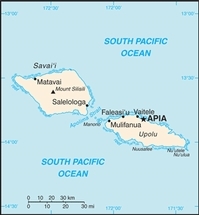 Produced with the backing and cooperation of the Samoa Department of Lands and the Visitor Bureau, this map features complete road information for the entire country. The latest edition features a much-expanded coverage of the capital Apia and has all the cultural and historical information to ensure that you'll not miss any of the highlights.